Stand out from the crowd with these dazzling 14k yellow gold sparkling hoop earrings. The shiny diamond cut detail goes all the way around the hoop so light gets reflected with your every step. And with 2 inch diameter, you won't be disappointed with the large size of these hoops. Perfect for a night out on the town, give your next evening outfit an extra bit of wow. A look that's dazzling, joyful, and effortless! 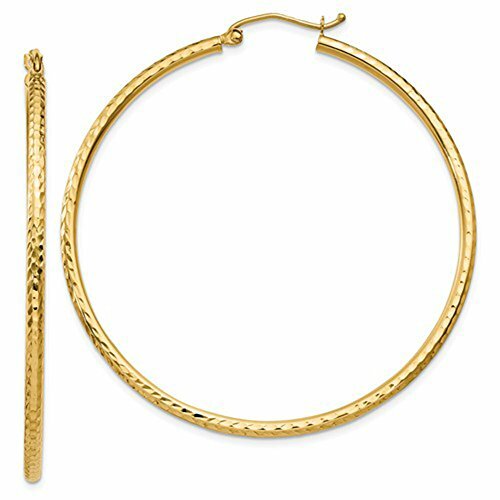 These hoops are 14k yellow gold. They are NOT plated, but have a pure gold body with a hollow interior. Every hoop comes with an authenticated 14k stamp. Each item comes gift wrapped in LooptyHoops brand packaging with informational cards on how to wear and care for your jewelry. If you have any questions about this product by LooptyHoops, contact us by completing and submitting the form below. If you are looking for a specif part number, please include it with your message.